Thinking that the Hulk has the size advantage, Wolverine launches into an attack. And, after a quick romp through the woods, the two discover that they’re really fighting over nothing. They split a meal in the forest and then return to the nearest town. Bruce Banner starts to hitch a ride but Wolverine is stopped by the nearby gas station attendant who suspects Logan is a wanted murderer. The next morning, Jack Russell decides he needs to do something about his lycanthropy. He trades a patch of his werewolf fur to his pal, Zontar, in return for Lemarchand’s Mourning Call. Within the parcment lies a powerful spell that he hopes will cure his curse. Using the spell, he calls forth the spirit of his father who reveals that he cannot bid rid of the werewolf. However, he does reveal that lycanthropy can be honed so that a finer balance can be struck between man and wolf. And, as his dad’s spirit departs, Isaiah Curwen (the Silver Dagger) kicks in Jack’s door! Stingray finds his wife and her kidnapper (her brother, Tiger Shark) in a cavern formerly used as a headquarters by Doctor Dorcas. Unfortunately, during their battle, part of the cave collapsed – on Diane! The Collective Man‘s request to leave his military base was denied – so he highjacked a helicopter and made his escape to visit his dying mother. Moments after he arrives, Ho Ti (the self-proclaimed god of happiness) shows up to take the Collective Man back to his superiors. But, the Chinese hero’s love for his mother overcomes Ho Ti’s commands. Unfortunately, the only feature that really caught my interest was the Werewolf by Night tale. The other three were pretty bland – although it was neat to see the Collective Man featured in his own solo story. The Wolverine/Hulk story seems to be all over the place (and not in a good way) and it’s really hard for me to believe that Stingray can survive a one-on-one fight against the crazed killer, Tiger Shark – let alone hold his own. Peter Sanderson isn’t a comics writer but he’s certainly a Marvel historian. He’s helped write the Official Handbook of the Marvel Universe along with several other guide books. 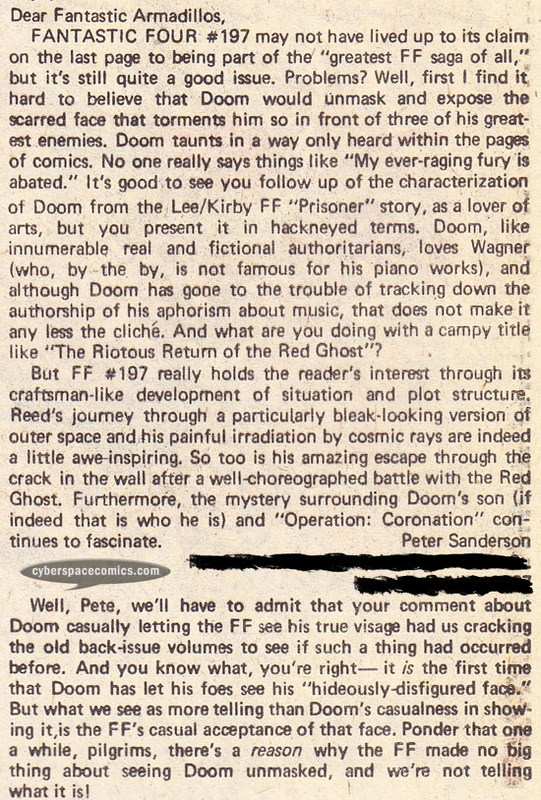 He got a letter printed in Fantastic Four #200 (cover date: November 1978), commenting on the issue where Doctor Doom revealed his face to the Fantastic Four. The response seems to indicate a reason why the FF weren’t surprised to see his face but I don’t remember this being followed up on. Must be one of those famous dangling plotlines. 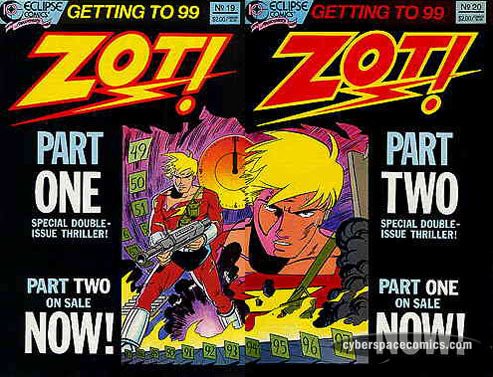 These Zot covers, from the professor of comics as an artform – Scott McCloud, combine into one image. 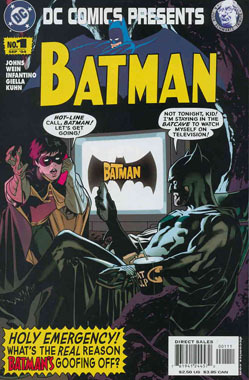 Batman #183 featured the second appearance of Poison Ivy! In this 2004 one-shot, Adam Hughes pays tribute to that classic Infantino cover from nearly 40 years prior. Sub-Mariner – Namor is the hybrid offspring of a human and an Atlantean. This ruler of Atlantis has super-strength (as long as his skin is wet) and can fly (thanks to those dainty ankle wings!). He’s also got an enormous chip on his shoulder. Wundarr – The planet Dakkam’s greatest astronomer, Hektu, believed that their sun would go nova, destroying their world. So, he put his newborn son, Wundarr, in a rocketship that landed on Earth. The child grew within the ship, never knowing of the outside world until the ship was opened by the Man-Thing. Wundarr emerged fully matured in body but not in mind. He possesses super-strength, some flight ability (or is it leaping? ), and an “entropy field” that nullifies energy. The Thing, who just happens to be nearby, notices this and launches into an attack to prevent any other New Yorkers from harm. Meanwhile, Namor and Namorita have journeyed to New York City to find Wundarr. When they discover their friend in battle with the Thing, they rush to his aid. And, to complicate matters even further, the enemies of Hektu send the Mortoid (a robotic assassin) to destroy Wundarr. This newfound threat unites the Thing, Namor, Namorita and Wundarr – the Mortoid and the Dakkamites are defeated. After the threat has been neutralized, Namor and Namorita explain to the Thing that Wundarr needs a “father figure” to teach him about the world, just before they depart to return to Hydrobase. The initial events take place just off the shore of Hydrobase, which is located off the North American coast in international waters. But, the scene quickly shifts to New York City (42nd Street, to be exact), once Wundarr makes his way to the mainland. WHEN does Wundarr next appear? Wundarr will be around in the very next issue! Steve Gerber, the writer of this series, created Wundarr in the pages of Fear, so it’s safe to assume that he had some plans for the character’s growth. It’s not often easy to put a new character in the spotlight, so this seems like an appropriate place to add him as a supporting character. 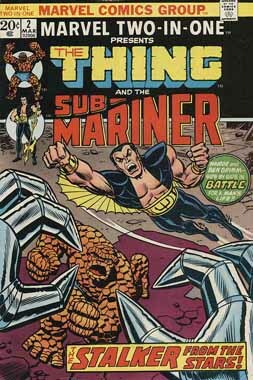 In 1968, the Sub-Mariner had split from his double-feature title, Tales to Astonish (which he shared with the Hulk), into his own solo title. 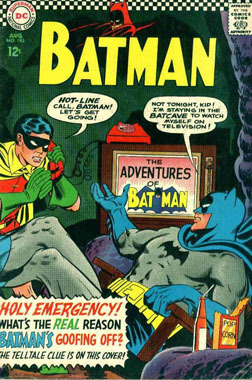 By 1973, sales of that title had begun to falter, and then-writer Steve Gerber was given enough slack to send the series in a “new direction” starting in issue #67 (cover date: November 1973). It could easily be argued that this issue was an attempt by Gerber to get Namor the Sub-Mariner (and his new costume), some much-needed exposure. Sadly, the plan didn’t work and Sub-Mariner was canceled with issue #72 (cover date: September 1974). The re-introduction of Wundarr is an interesting treat. Essentially, he has the same origin story as Superman but, he’s got a unique slant: full-grown body run by an infantile mind. I’m curious to see how the character develops now that he’s been left in Bashful Benjy’s hands. Speaking of that, it seems a little odd that Namorita (who’s really the only character in this story that shows any true care for the Dakkamite) would leave Wundarr with the Thing. To be honest, the way the story had progressed, I assumed that she would be taking him back to Hydrobase. Note: This issue’s letters column features commentary on Marvel Feature #12. Additionally, this comic includes Marvel Value Stamp #63 (the Sub-Mariner). The rest of the world thinks the X-Men are dead but Wolverine knows better and he’s ventured to the Carolinas to find them. On the road, he rescues a man from a bear attack but the ungrateful man wanders off into the woods. Wolverine decides he can’t leave the man alone so he chases after him to discover .. the Hulk! Jack Russell (the Werewolf by Night) wakes from a nightmare to find himself in the Howling Room. That’s the cage he locks himself in during the full moon to prevent his lycanthropic curse from getting out of hand. As the moon’s light shines down through the metal bars, he transforms into the werewolf. Finding itself chained, the beast begins to gnaw its own arm off to escape – but, it’s quickly knocked unconscious by the thorazine that Jack took just prior to transforming. Meanwhile, a puritan named Isaiah Curwen has made his way to the city and decided that the monster named Jack Russell has to die. As Stingray is talking to Tiger Shark (in the hopes of him releasing his hostage, Stingray’s wife), the Guardsman comes to and launches a sneak attack on the villain. We’re then treated to quite a battle! But, the inexperienced heroes are ultimately defeated by Tiger Shark who takes his hostage and flees the scene. After he hooks the Guardsman up to the facility’s life support system, Stingray sets out to find Tiger Shark – and more importantly, his wife! At a new exhibit, the Shroud notices that a woman (named Firefly) is attempting to smash the Kali statue. The Shroud, believing it to be the actual Statue of Dark Powers, steps in to prevent the destruction. Firefly exhibits light powers that disorient the Shroud and allows her to get away. Later, we find out that the Cult of Kali murdered her family – and she seeks revenge on the Cult’s High Lord: Krago. The Shroud recognizes Krago as an abuser of Kali and attempts to join forces with Firefly – but, it appears that she would rather die than ally herself with the Shroud for she believes him to be as evil as Krago. 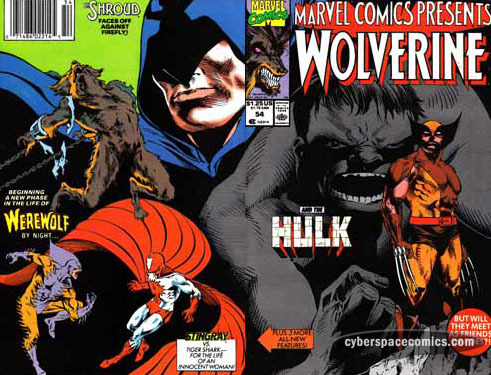 The Wolverine vs Hulk feature seems open to lots of possibilities right now. They look like they’re about to square off but, that could just be a dramatic cliffhanger ending. I’m interested to see how this will progress. Werewolf by Night’s feature was very cool. Kaminski did a wonderful job of portraying Russell’s fears of becoming the werewolf AND the werewolf’s disdain for his human side. This was really enjoyable and I’m excited to see how this story pans out. Stingray’s feature was a big battle but little actually happened in those eight pages. And, with the final story, I find yet another Steve Ditko feature that fails to truly capture my interest (ever read Speedball? *snooze). Here’s another famous fanmail from Kurt Busiek. He got a letter printed in Fantastic Four #187 (cover date: October 1977), asking for the return of artist, George Perez. Busiek later went on to work with Perez on a great Avengers run from the Heroes Return era. And, as for Graviton, Busiek utilized the villain in a Thunderbolts tale that saw the return of the Great Lakes Avengers! 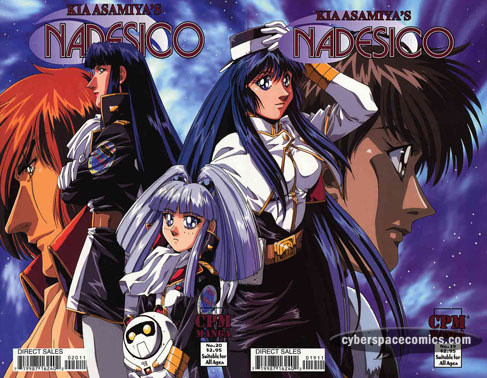 CPM Manga’s Nadesico has a few covers that connect together. Here’s one set. 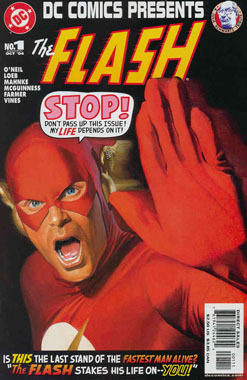 Alex Ross pays tribute to a classic Infantino cover from nearly 40 years prior! Man-Thing – Ted Sallis was attempting to rediscover the Super-Soldier Serum when he injected himself with the experimental formula. Soon after, his car crashed into a chemical-tainted swamp – the mixture of formula, swamp water and chemicals turned him into the Man-Thing. Now, he is a mindless muck monster, unable to process thoughts but highly empathic. The swamp beast is drawn towards strong emotions and has an unusual reaction to one in specific: for, whatever knows fear, burns at the touch of the Man-Thing. The Molecule Man (II) teleports to Earth in an effort to take revenge on his father’s enemies, the Fantastic Four. He homes in on the Thing’s energy first, which deposits him in the Florida Everglades, where the rocky FF member is tracking down the Man-Thing. 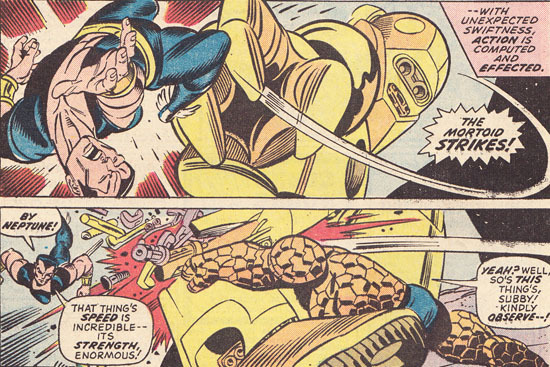 He engages the Thing and their scuffle quickly draws the attention of the Man-Thing. Using his advanced abilities, the Molecule Man (II) can also manipulate organic molecules, as well as inorganic (a feat his father could never accomplish). And, it’s with those abilities that he transforms both the Thing and the Man-Thing into their human forms, Ben Grimm & Ted Sallis, respectively. With the strongest threats to his mission now neutralized, the Molecule Man (II) departs to take out the other three members of the Fantastic Four. Grimm & Sallis soon catch up with him and he foolishly changes them back into their monstrous forms. During the fight, the Thing separates the villain from his wand, the power source that keeps his body from disintegrating. Unfortunately for him, he’s kept away long enough that his body is turned into dust … and the wand, which now appears powerless, is left in the hands of a small child. 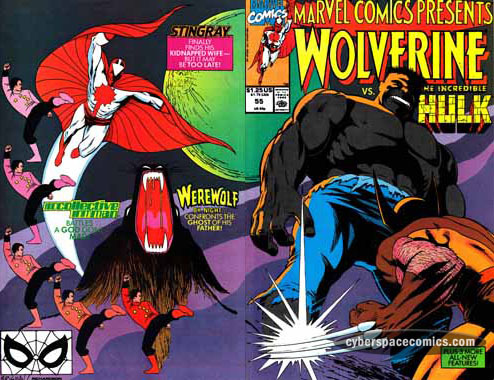 After the events of Marvel Feature #11-12, the hot-headed Thing travels from New Mexico to the Florida Everglades to take on this “new guy on the block” who stole his name. Little does he know, at first, that the swamp creature can’t even think or speak – let alone tell others to call him the Man-Thing. WHEN does the Molecule Man next appear? This Molecule Man doesn’t appear again but, his father (the original Molecule Man) returns in Iron Man Annual #3, where it is revealed that his essence was inside the wand. WHY is Man-Thing the guest-lead? 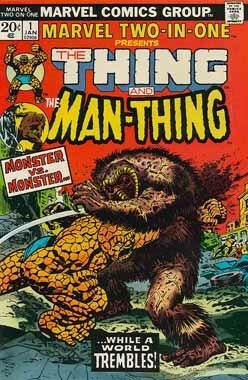 After debuting in Savage Tales #1 (May 1971), the Man-Thing went on to take the lead feature in Adventure Into Fear, starting with #10 (October 1972) and continuing to #19 (December 1973). Steve Gerber’s tales of the swamp beast had proved popular enough to be given its own title, and Man-Thing #1 debuted with a cover date of January 1974 – conveniently enough, that’s the cover date of this issue, as well. 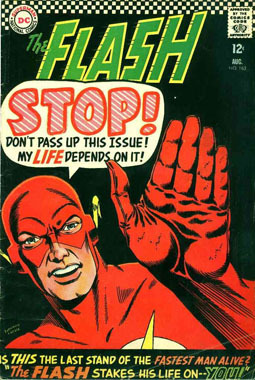 So, it seems this comic was meant to serve as a promo for his series debut. Gerber introduced a neat concept by changing the two monsters back into their human forms. I wouldn’t have minded a lot more of the book devoted to the interesting character moments that companionship could have provided. Think about it – two disgusting monsters have been granted a rare opportunity to be back in their own skin AND they have someone with them that has gone through the same experience! That’s great stuff, there. Especially since that’s not too common a trait to share with somebody else. 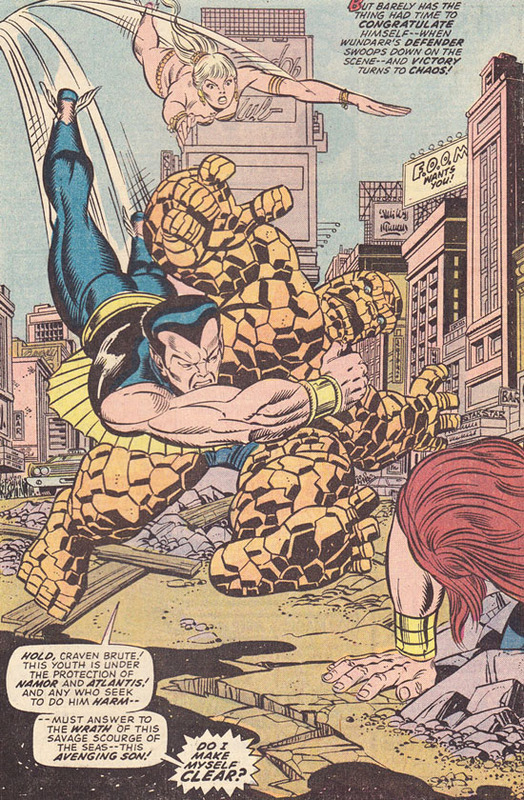 Now, I realize that Ben Grimm is a heroic character so he’s pretty much duty-bound to take on the villain who’s out to get him and his friends but, I feel like Ted Sallis would have logicly just fled the scene instead of putting himself in a position to be transformed back into the mindless Man-Thing. 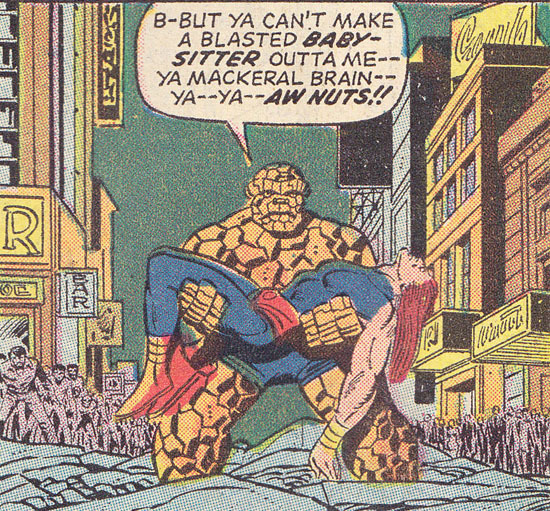 At least the Thing retains his own mind when he’s in his rocky form – the Man-Thing can’t even process thought! 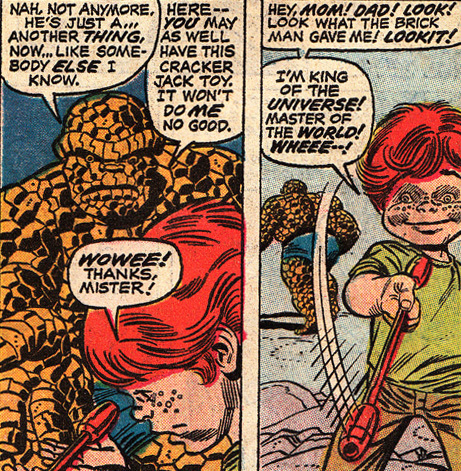 But, I think the biggest blunder of the story is when the Thing just hands the Molecule Man’s wand over to a little boy. C’mon! Everybody knows you can’t just go leaving stuff like that around. 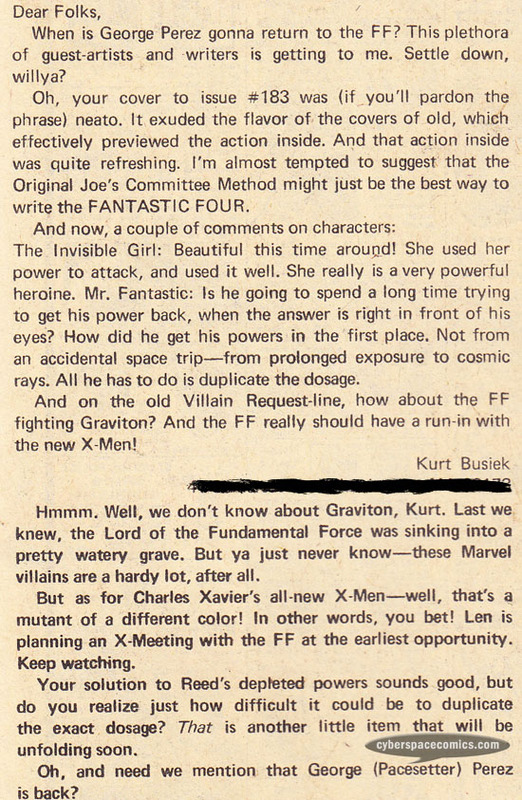 Note: This issue’s letters column features commentary on Marvel Feature #11 (the debut of the Two-In-One concept).